Probate is the legal process that transfers ownership of a person’s property to his beneficiaries after he dies. The deceased's debts and taxes are typically also paid off during the proceeding, which is usually necessary with or without a will. Each state has its own laws for probate proceedings. Those in West Virginia aren’t particularly unique, with the exception that the courts in this state take on some of the administrative tasks that would normally fall to the executor of an estate. If your loved one dies in West Virginia, you have 30 days to submit his will to the court. If you don’t, and the will was in your custody at the time of his death, you’re guilty of a misdemeanor criminal offense. The proper court is the one in the county where the deceased lived at the time of his death or -- if he didn’t live in the state -- in the West Virginia county where he owned property. You must take a copy of his death certificate when you submit the will, and the will must be the original, not a copy. The court clerk keeps the will and mails notice of the death to the executor named in it, if this isn’t you. The clerk will also take care of sending notice to all the beneficiaries named in the will. The executor can claim the will from the clerk and apply to have it admitted for probate. The will must be proved, which means the court accepts it as valid. To prove the will, the witnesses make statements under oath that they were present for the will signing. 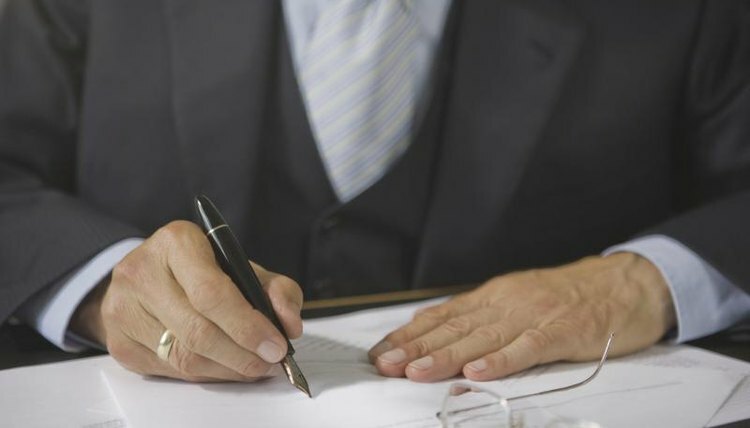 However, since West Virginia law recognizes self-proving affidavits, their testimony isn't necessary if the witnesses signed an affidavit at the time the deceased signed his will. One of the executor’s first tasks under West Virginia law is to complete and file Estate Appraisement and Inventory forms within 90 days of taking office. The forms list the property the deceased owned, along with each asset’s value. You don’t have to include non-probate assets -- which are those that pass directly to designated beneficiaries by some other means. For example, a life insurance policy or retirement asset might name an individual as beneficiary rather than the estate, or the deceased might have held title to property with another individual with rights of survivorship. These assets are not part of his probate estate but pass directly to the beneficiaries. The probate process in West Virginia also requires that the estate pay off the deceased’s debts. When the executor files the Estate Appraisement and Inventory forms with the court, the court clerk posts a notice in the county’s major newspaper, alerting the deceased’s creditors that they have 90 days to file a claim with the estate for the money they’re owed. Creditors make claims directly to the court in West Virginia -- and the court notifies the executor as the claims come in. The executor is responsible for paying them from estate funds. You can deny any claims that you don’t feel are legitimate, but rejected creditors can appeal to the court to try to reverse your decision. When the deceased’s debts and taxes are paid, the executor can close out the estate. West Virginia law allows you to do this in one of two ways: If you have the consent of all the estate’s “residuary” beneficiaries -- those who didn’t receive a specific item of property but rather shared in the balance of the estate -- you can ask them to sign an agreement for a short form settlement. If they won’t sign, you must take the more complicated step of filing a Proposed Final Settlement of Accounts with the court. This details all money the estate took in and what was paid out. The court clerk will run a Notice of Settlement in the newspaper and if no objections are received, the court will give you the go-ahead to distribute property to beneficiaries and close the estate. Jefferson County Clerk: What Is Probate? Bird, Beverly. "Probate Laws in West Virginia." , https://legalbeagle.com/6328680-probate-laws-west-virginia.html. Accessed 19 April 2019.